On Friday, March 1, at 1 p.m. in Room 2E of the Legislative Office Building, the Education Committee will be holding a public hearing on legislative proposals to force smaller school districts to regionalize into much larger ones. This legislation affects Lyme-Old Lyme Schools because even though Lyme and Old Lyme are already regionalized into Regional District 18, the total number of students in the district is significantly less than 2,000, which is proposed as the minimum size (number of students) of any school district. For more information on and background to this topic, see our previous article published Feb. 26, titled, Two Bills in Hartford Propose Regionalizing, Consolidating School Districts. Requires any school district with a student population of fewer than 2,000 students to join a new or an existing regional school district until that district equals 2,000 or more. The concept of state-forced regionalization is supported by the Senate President, Martin Looney, and the Senate Majority Leader, Bob Duff. 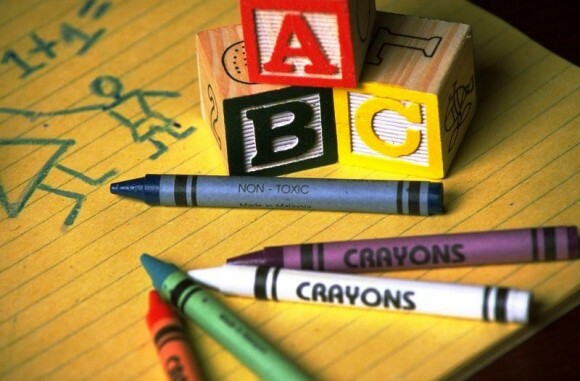 Governor Lamont supports forming a commission that would create a statewide plan for forced regionalization and penalize school districts that don’t participate. These bills would impact Lyme and Old Lyme despite the fact that they are already regionalized, since these bills call for districts larger than Regional District 18. 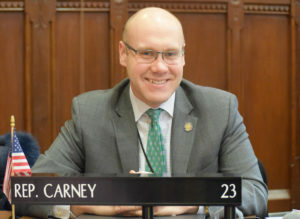 State Rep. Devin Carney testifies in the House. File photo. He adds, “Whether you support these ideas or not, I would encourage you to make your voice heard. You can have your voice heard by submitting written testimony to the committee or you can testify in person. You can submit written testimony by sending an email to edtestimony@cga.ct.gov. Please make sure to reference the bill numbers you are submitting testimony for/against and copy me on the email at: Devin.Carney@housegop.ct.gov. Sign ups for the public hearing will be from 10 a.m. to 12 p.m. in the lobby of the Legislative Office Building. The order is first-come, first-serve. The first hour of testimony is reserved for public officials, and after that, students will be given preference so that they can finish early. Everyone who signs up gets to speak, and the hearing will remain open until there are no more speakers. If you are speaking at the hearing, you should also submit written testimony so that it will appear in the public record, in the file of each bill. Legislators often refer to written testimony when they are voting on the House or Senate floor – especially when they have not come across a bill earlier in the session. You may submit written testimony regardless of whether you are speaking at the hearing. Carney notes in his email, “”This is anticipated to be a long hearing, so plan accordingly if you plan on attending. The purpose of the Program is to foster awareness in two of the four pillars of American Legion service: “Mentoring the Youth of our Nation” and “Promoting Patriotism and Honor.” In doing so, the Post hopes to promote the importance of the Memorial Day holiday in our students including the history of the name, specific historical events and the knowledge of contribution, sacrifice and service to our Nation of our own Town’s Veterans. Winners receive a monetary award, an Americanism Medal with certificate and an US Flag flown over our Nation’s Capital. The Post hopes to engage each year’s winners in a process to educate their neighbors and citizens of our Towns through public speaking and sharing their essay during Memorial Day and school events. Voting is underway in the referendum on the proposed Lyme-Old Lyme Schools Board of Education 2018-19 budget. Voting is taking place in Lyme and Old Lyme from 6 a.m. to 8 p.m. at Lyme Town Hall and Cross Lane Firehouse respectively. The proposed budget for the 2018-19 school year, which the board of education approved in February, is $34,298,528 representing a 1.97 percent increase over the current year. Due to today’s winter storm, Lyme-Old Lyme Schools are closed and tonight’s Old Lyme Water Pollution Control Authority (WPCA) and Board of Finance (BOF) meetings have been cancelled. The WPCA meeting will now be Thursday, March 15, at 7:30 p.m.in the Meeting Hall at Memorial Town Hall. The BOF meeting will be held Tuesday, March 20, at 7 p.m. in the Meeting Hall at Memorial Town Hall. 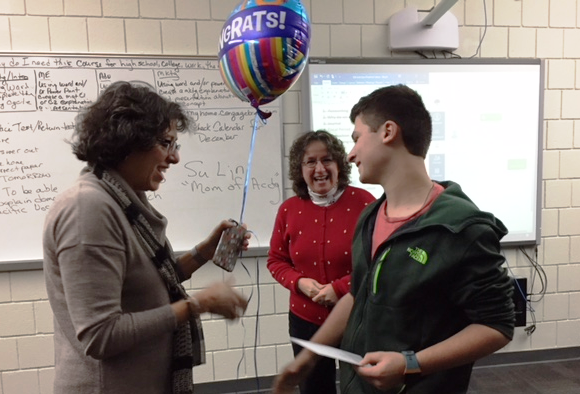 Lyme-Old Lyme High School Assistant Principal Jeanne Manfredi presents Lyme-Old Lyme High School junior Patrick Looney with his award as the Lyme-Old Lyme Chamber of Commerce December 2017 Business Student of the Month. 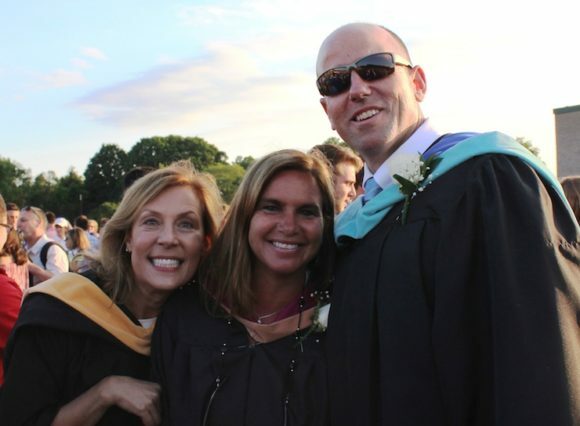 Leslie Traver, Lyme-Old Lyme High School Business Department Chair, joined the celebrations. Lyme-Old Lyme High School junior Patrick Looney has been named the Lyme-Old Lyme Chamber of Commerce ‘Business Student of the Month’ for December 2017. The Chamber’s ‘Business Student of the Month’ program continues the Chamber tradition of recognizing members of the junior class for demonstrating outstanding initiative in and out of the classroom. The Lyme-Old Lyme Chamber of Commerce established the N. Rutherford Sheffield Memorial Award for Entrepreneurial Promise & Achievement for Lyme-Old Lyme High School juniors in 1999 as a way to honor Mr. Sheffield, a member of the Chamber for over 50 years who was highly regarded in our Lyme-Old Lyme community. 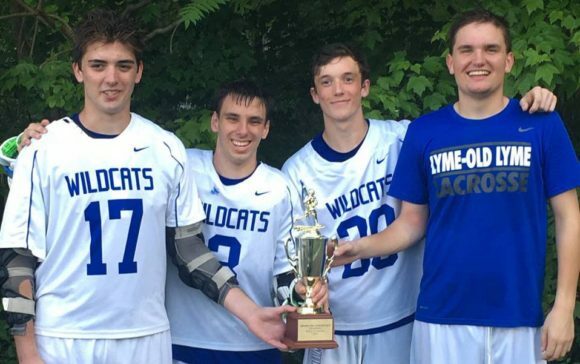 Since its inception, nearly 35 juniors at Lyme-Old Lyme High School have been recognized through this program. Lyme-Old Lyme High School senior Caroline Wholean. AREAWIDE — The selection committee for the Carolyn R. Greenleaf Memorial Fund of Community Music School has chosen two local music students as the recipients of the Fall 2017 Carolyn R. Greenleaf Music Award: pianist Caroline Wholean and violinist Schuyler Dragoo. This award is given each semester to two high school students who have demonstrated exceptional musical ability and motivation, and awards a semester of private lessons at Community Music School in Centerbrook. Caroline Wholean is a senior at Lyme-Old Lyme High School. Her rigorous academic schedule is supplemented with rowing for the crew team, competing on the math team and playing clarinet in the high school band and wind ensemble. A student of Community Music School for 12 years, she has taken violin and piano lessons and is a member of the String Ensemble. She was recently awarded the Connecticut Secretary of State’s Excellence in Citizenship Award. Caroline plans to continue her music education in college next year. Schuyler Dragoo is both a violinist and a vocalist who will be entering her sophomore year at Haddam-Killingworth High School. Schuyler has been studying violin for eleven years with Irene Rissi in Waterford. 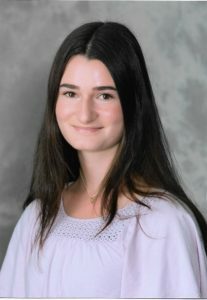 She has participated in the CT Southern Region Orchestra for the past four years, and has attended Point CounterPoint, a chamber music camp in Vermont, for the past five years. Schuyler will be singing with the select choir in school this coming year, and is looking forward to using this scholarship to further her vocal technique and abilities at the Community Music School. The Carolyn R. Greenleaf Memorial Fund was established at the Community Foundation of Middlesex County in 2008 by her friends to honor Greenleaf’s dedication to music and education. 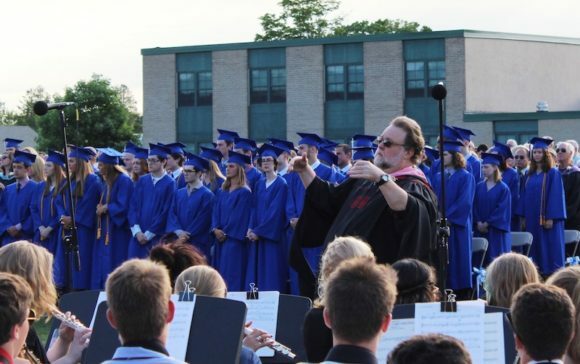 The Carolyn Greenleaf Memorial Music Award is open to students of Middlesex County and the Lymes and is awarded twice a year, based entirely on merit. Editor’s Notes: i) Community Music School is an independent, nonprofit school which provides a full range of the finest possible instruction and musical opportunities to persons of all ages and abilities, increasing appreciation of music and encouraging a sense of joy in learning and performing, thus enriching the life of the community. ii) Community Foundation of Middlesex County is a nonprofit organization dedicated to improving the quality of life in Middlesex County. Working with charitably-minded individuals and organizations to build permanent endowments since 1997, the Community Foundation has provided 850 grants totaling more than $2.5 million to organizations for the arts, cultural and heritage programs, educational activities, environmental improvements, and for health and human services. Paul Gleason’s Old Lyme soccer girls defeated Old Saybrook 3-0 at home today. Lydia Tinnerello was first to score and Mya Johnson followed up with two goals. There were no assists. Emily Rivera was in goal for Old Lyme and had two saves. Kelsey True was in net for Old Saybrook with six saves. Old Lyme is 6-0-0 overall and 3-0-0 in the Shoreline. The following are brief reports from each game that has contributed to the Wildcats’ current unbeaten record. 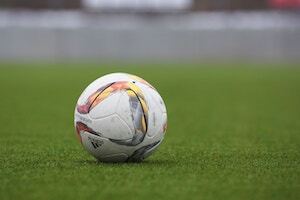 On Wednesday, Old Lyme defeated East Hampton 4-0 at Lyme-Old Lyme High School. Kaylee Armenia had two goals, Maddie Ouellette had two goals and one assist, while Caroline Wallace added an assist. Emily Rivera was in net for Old Lyme with three saves and Emma Cook was in net for East Hampton, also with threee saves. Old Lyme defeated Westbrook at Westbrook High School last Friday, Sept. 15, 6-0. Mya Johnson was the first to score in the first half with an assist from Maddie Ouellette. Ciara Klimaszewski scored three goals; one in the first half unassisted and two in the second half assisted by Britney DeRoehn and Colleen Walsh. Grace Lathrop scored unassisted in the first half and Maddie Ouellette scored unassisted in the first half. Emily Rivera and Emma McCulloch were in goal for Old Lyme with one save each. On Sept. 12, Old Lyme defeated Morgan 2-0 at Lyme-Old Lyme High School. Maddie Zrenda scored the first goal assisted by Mya Johnson in the first half. Emily DeRoehn scored the second goal in the second half assisted by her sister Brittany DeRoehn. In goal for Old Lyme was Emily Rivera who had seven saves. In goal for Morgan was Rebecca Cockley with nine saves. Lyme-Old Lyme High School Principal Jim Wygonik (left) stands with CABE Leadership Award high school winners Callie Kotzan and Daniel Cole. 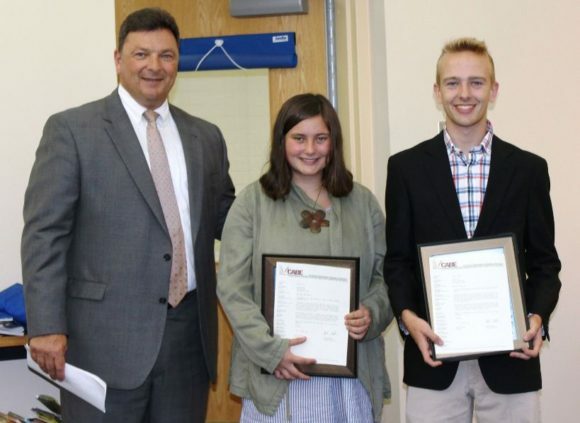 Daniel Cole and Callie Kotzan, 12th grade students at Lyme-Old Lyme High School, and Aidan Powers and Isabella Hine, 8th grade students at Lyme-Old Lyme Middle School, were recently recognized by the Connecticut Association of Boards of Education (CABE) with a Student Leadership Award. 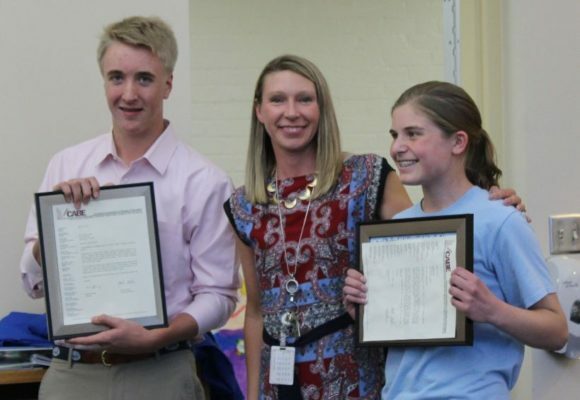 Lyme-Old Lyme Middle School Principal Michelle Dean stands with CABE Leadership Award middle school winners Aidan Powers and Isabella Hine. Superintendent Ian Neviaser and the Lyme-Old Lyme Board of Education recognized these students at the June 7 Board of Education meeting. The traditional cap toss rounded off a special evening celebrating the Class of 2017. 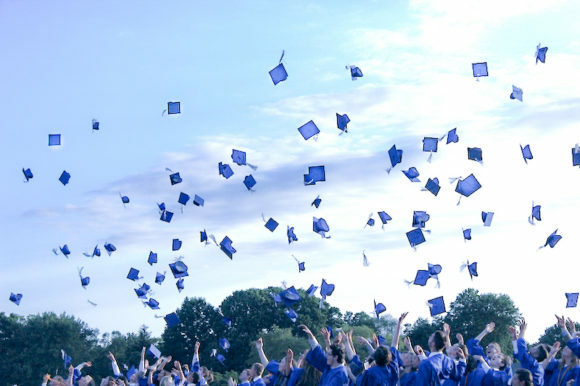 It was a truly beautiful June evening last Thursday as 118 students received their high school diplomas along with the privilege of calling themselves alumni of Lyme-Old Lyme High School (LOLHS.) 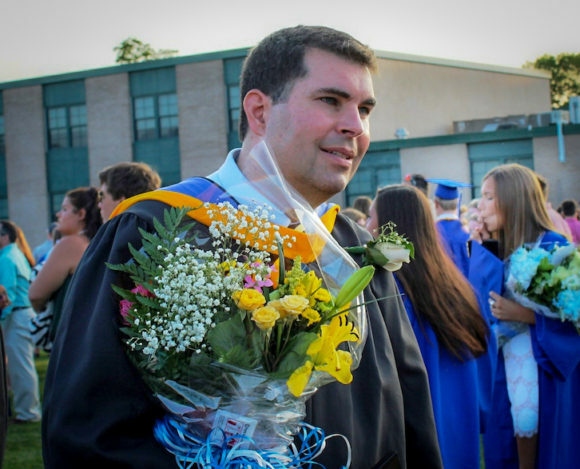 Principal James Wygonik, class advisor Brett Eckhart, and four empowering students reflected in different ways on the class’s past four years at LOLHS. Class of 2017 Adviser Brett Eckart proudly wears the Class of 2017 pin with which he displaced the one for the Class of 2005. Brett Eckart, who served as Class of 2017 Adviser and is a social studies teacher at the high school, used a multiplicity of props to enhance his speech to the class. 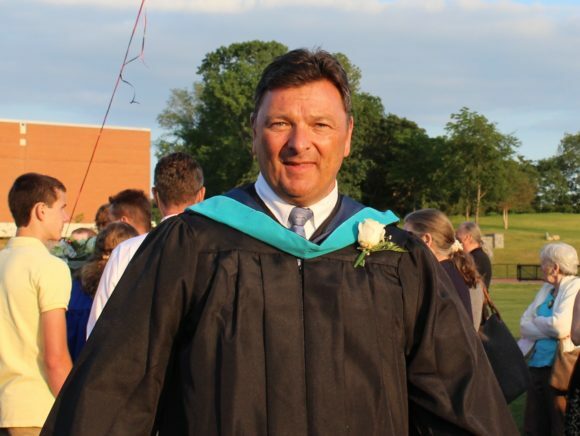 He confessed that he knew this class was tired of hearing about the “Great Class of 2005,” which he had always regarded as the ultimate class in terms of their character and achievements. He duly placed a large 2005 pin on his gown to remind them of that fact one last time. 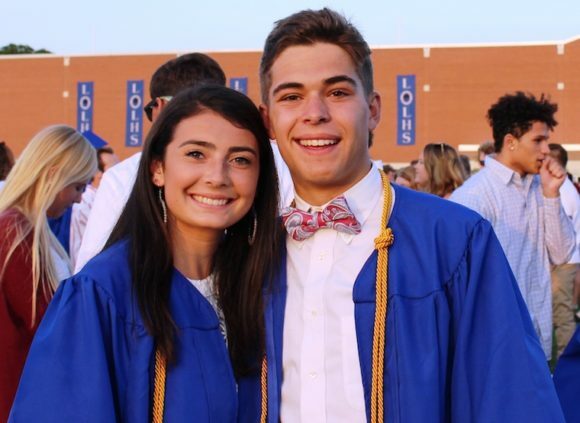 Lauren Quaratella stands with a fellow graduate, whom she first met at Lad & Lassie Pre-School. But by the end of his speech, after describing some of the many memorable times he had shared with the Class of 2017, he reached down into the podium, pulled out something and then proceeded to stick an even larger 2017 pin over the 2005 one to indicate how this class has now risen to prominence in his mind over that of 2005. Eckart also reminded the class not always to focus on their destination but to savor the journey along the route. Lyme-Old Lyme Schools Superintendent ian Neviaser, Board of Education Chairman Mimi Roche and Board of Education member Nancy Edson share a smile after the ceremony. 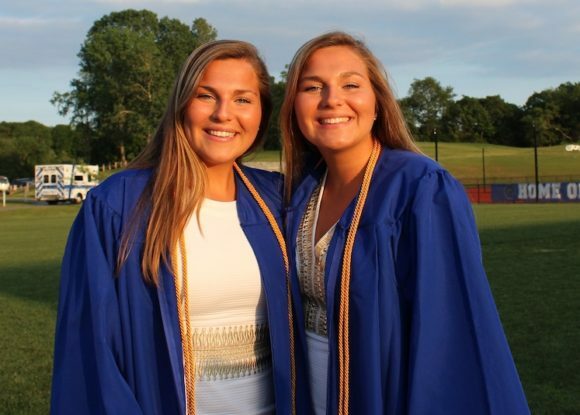 Twins Maggie and Abbie Berger celebrate their graduation. 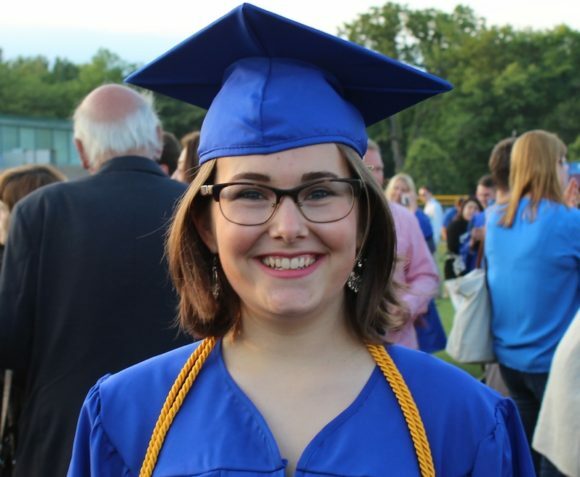 Honor Essayist Rachel Hayward used the children’s book, Oh the Places You’ll Go, by Doctor Seuss to highlight the accomplishments she and her classmates have made, and the endless opportunity that awaits the class in the future. Quoting Seuss’s famous words, she told her classmates, “You have brains in your head. You have feet in your shoes. 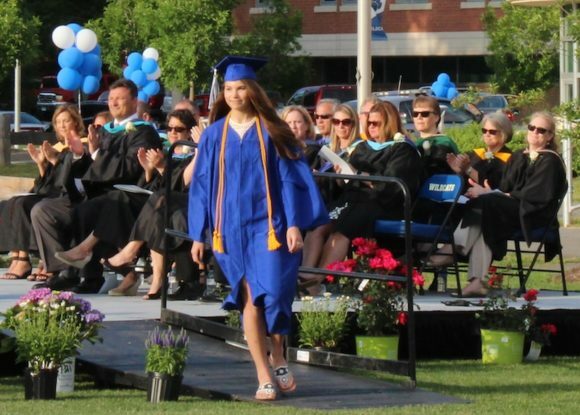 You can steer yourself any direction you choose,” … and the direction Hayward has chosen for herself in the autumn is Lafayette College, Pa.
Salutatorian Laura Wayland steps down from the podium after giving her speech. Valedictorian Natalie Rugg smiles after giving an emotional, stirring speech. Lyme-Old Lyme Schools Board of Education members, administrators, faculty and seniors file into the Thursday evening’s graduation ceremony led by the Class Marshals. 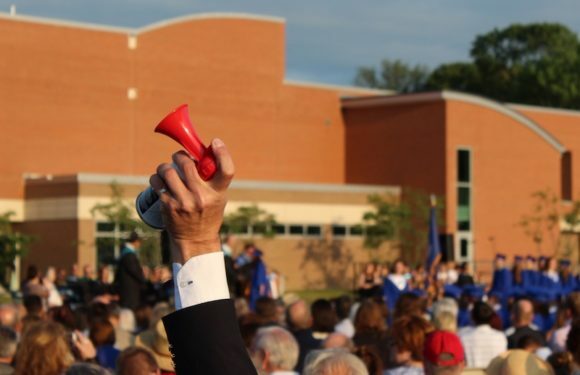 Celebrating a certain graduate with a special sound. The LOLHS Chorus sang ‘Unwritten’ under the direction of Chorus Director Kristine Pekar. Mildred Sanford Outstanding Educator Award winner Jon Goss chats with a graduate after the ceremony. Continuing a privilege afforded to the senior graduating class, officers of the Class of 2017 then presented the Outstanding Educator Award in memory of Mildred Sanford to the faculty member selected by their class, Technical Education teacher Jonathan Goss. After the distribution of diplomas, the newly-pronounced alumni threw their caps high into the air in the traditional, celebratory hat toss, the band struck up the Sine Nomine Ceremonial March in a British Style by Ralph Vaughn-Williams and the graduates marched out into the arms of awaiting friends and family to celebrate their success. 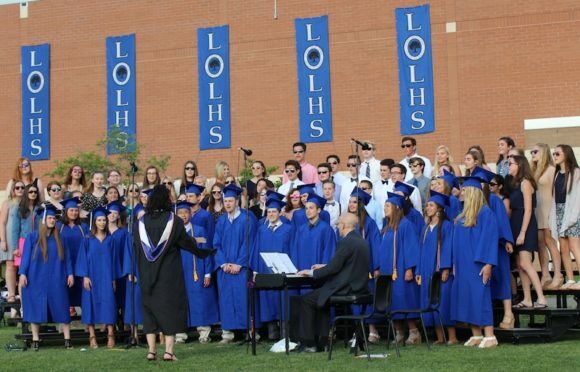 The LOLHS Chorus led the singing of the school’s Alma Mater. 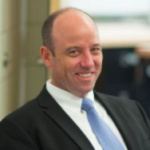 The Lyme-Old Lyme Schools have announced the appointment of Noah Ventola as the next Assistant Principal of Lyme-Old Lyme Middle School. Ventola will begin his new position on July 1. 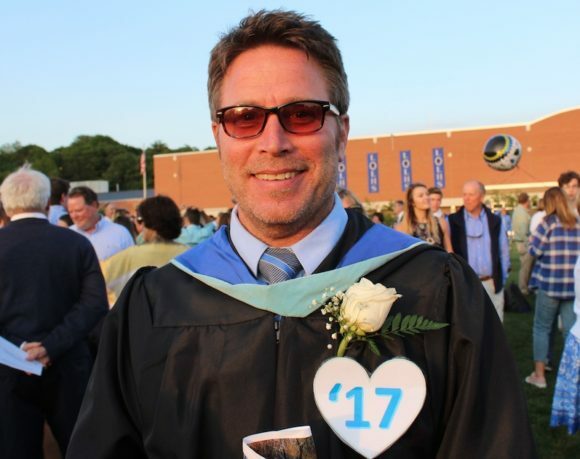 Ventola joins the Lyme-Old Lyme Schools after serving the East Haddam Schools as a social studies teacher, assistant principal, and department chair as well as chair of the Curriculum Council. He is a graduate of the University of Vermont and holds advanced degrees from both Eastern Connecticut State University and Southern Connecticut State University. 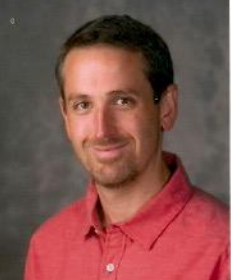 Ventola also has previous experience in the Region #8 Schools as a social studies teacher. He lives in Durham with his wife and children. 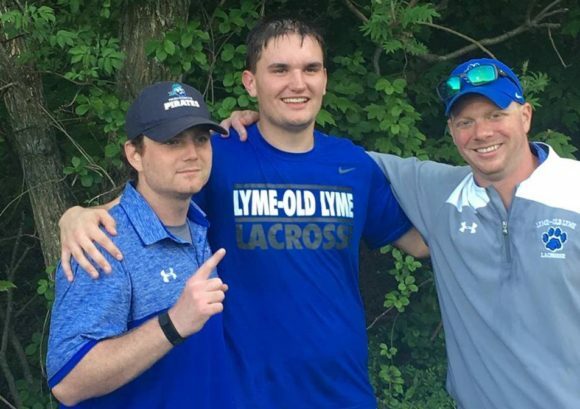 Rob Wallace (center) of Old Lyme is suffering from liver cancer, but now after an extended search, a donor has been found for Rob and surgery is scheduled at the end of the month. His wife Lori (second from left) is an instructor at ‘Fitness on the Water’ at Water’s Edge in Westbrook, where they are holding a fundraiser Saturday for Rob’s medical expenses associate with the surgery that are not covered by insurance. Rob and Lori’s three children complete the photo. Old Lyme resident Rob Wallace, diagnosed with liver cancer in 2015, has found a live organ donor. The surgery is scheduled for the end of June and he will be out of work at Arch One Glass in Old Saybrook for quite some time. 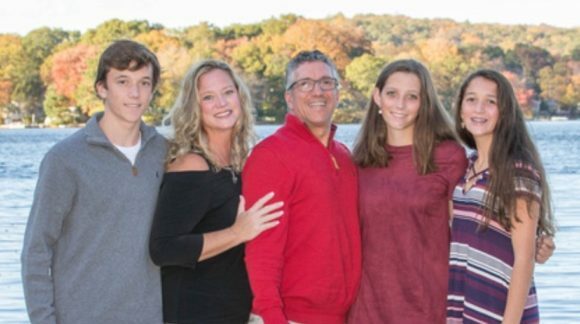 To help defray some of the medical expenses not covered by insurance, the Wallace Family is getting a leg up from Fitness on the Water in Westbrook, where Rob’s wife Lori is a popular Spin and Yoga instructor. A fitness fundraiser, Saturday, June 10 from 7:30 a.m. to 12:30 p.m., offers all exercise classes for $10 (cash and check only) with 100 percent of the funds going to the Wallace family. Fitness on the Water instructors are all donating their time for this special event taking place in the three exercise studios, located at 1587 Boston Post Road at Water’s Edge. Enjoy raffles and refreshments to support this event and make a donation of any size to the Wallace family. The LOLHS 4 x 800 relay team of (from left to right), Danny Cole,Trevor Wells, Danny Reid, and Corey Knepshield, has advanced to the State Open Championship. 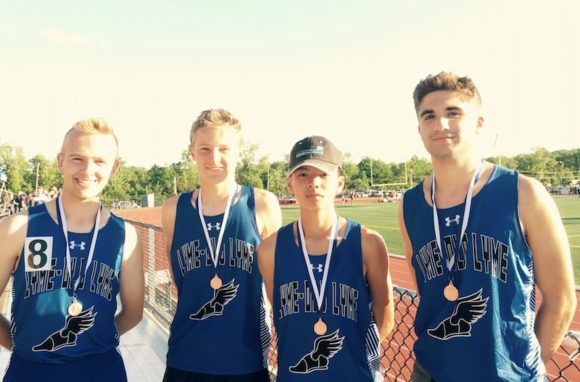 The Lyme-Old Lyme High School boy’s 4 x 800 team of Danny Cole, Trevor Wells, Danny Reid, and Corey Knepshield raced their way to 3rd place in the CIAC Class S track state championships Thursday. They now advance to the CIAC State Open Championship on Monday. Congratulations to this great team and Go Wildcats! The Lyme-Old Lyme High School baseball team fell to Lyman Memorial 2-1 in a CIAC state quarter-final Saturday afternoon at Lyman Memorial. 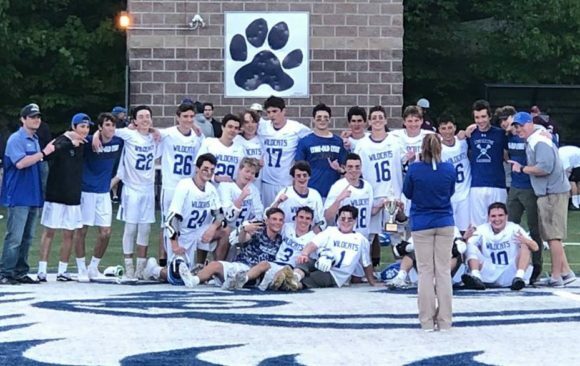 Congratulations on a great season, boys! 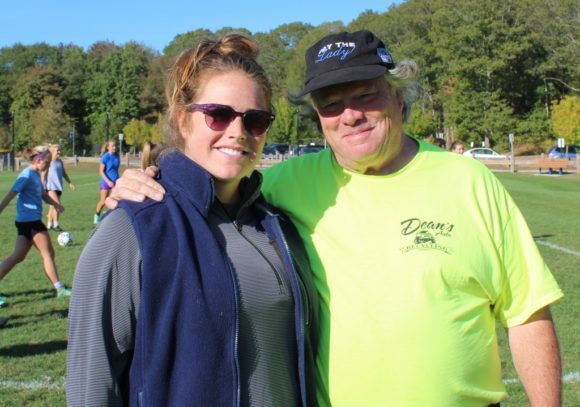 Sadly, Emily Macione’s girls, who had already claimed the Shoreline Conference championship, bowed out of the state tournament on Thursday after a devastating 12-11 loss to New Fairfield. Congratulations on a great season, girls! 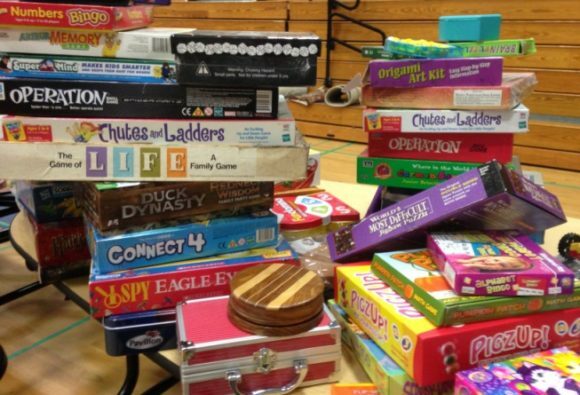 The 2nd annual Friends of Music Tag Sale, will bring bargains galore to the Lyme-Old Lyme High School’s (LOLHS) gym and Commons areas on Saturday, April 22, from 8:30 a.m. to 12:30 p.m. Proceeds from the sale will help advance the mission of the Lyme-Old Lyme Friends of Music, who provide support to the music programs in Lyme-Old Lyme Schools at all levels. 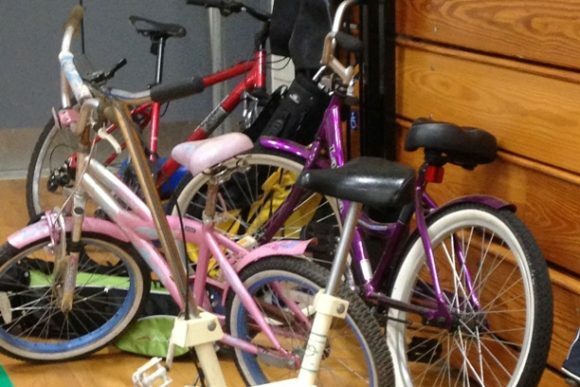 Items for sale will include housewares, toys, books, CDs and DVDs, sporting goods, furniture, tools, and more. Clothing and bedding will not be included in the tag sale. Spring cleaning? Moving? 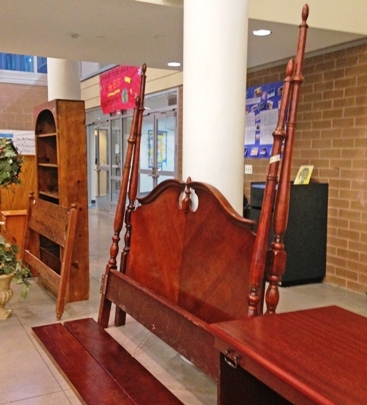 Donations of items to the Friends of Music Tag Sale will be gladly accepted on Friday, April 21, from 4 p.m. to 8 p.m. at the high school: housewares, furniture, sporting goods, toys, books, CDs and DVDs, artwork, tools, etc., in good condition—but no clothing, please. Friends of Music was established in the early 1980s in response to District budget cuts that threatened to affect arts programs in our schools. 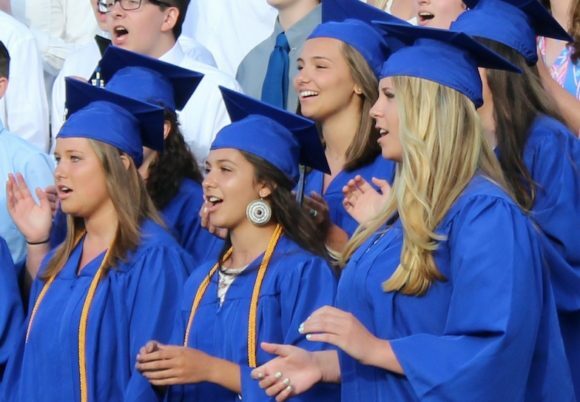 Today Friends of Music provide support to Lyme-Old Lyme Schools music programs at all levels: materially, by funding unbudgeted and unexpected items, and administratively, by assisting with uniform distribution, staffing at events, and more. Friends of Music also supports LOLHS students individually by awarding scholarships to selected graduating seniors. More information on Friends of Music and the 2nd annual Tag Sale can be found at www.friendsofmusiclol.org or e-mail friendsofmusiclol@gmail.com. As a registered 501(c)(3) nonprofit organization, Friends of Music can accept matching funds from employers. State champions! The Lyme-Old Lyme Middle School Science Olympians proudly display their winner’s trophy. It’s not only the UConn Women’s Basketball team that’s enjoying an extraordinary run. 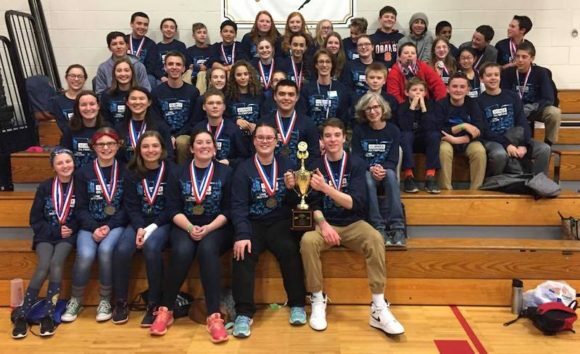 This weekend, the Lyme-Old Lyme Middle School Science Olympiad team completed a remarkable feat by taking top honors in the 2017 Connecticut Science Olympiad State Championship for the fifth time in the past six years. And now, as reigning state champions, the Lyme-Old Lyme team moves forward to the National Science Olympiad Competition on May 19-20, in Dayton, Ohio, where its members will represent the State of Connecticut. The Lyme-Old Lyme team again dominated the Connecticut contest amassing gold medals in nine events, silvers in 10, and bronze medals in three events. Science Olympiad competitions are like academic track meets, consisting of a series of 23 team events in each division (Division B is middle school; Division C is high school). Each year, a portion of the events are rotated to reflect the ever-changing nature of genetics, earth science, chemistry, anatomy, physics, geology, mechanical engineering and technology. 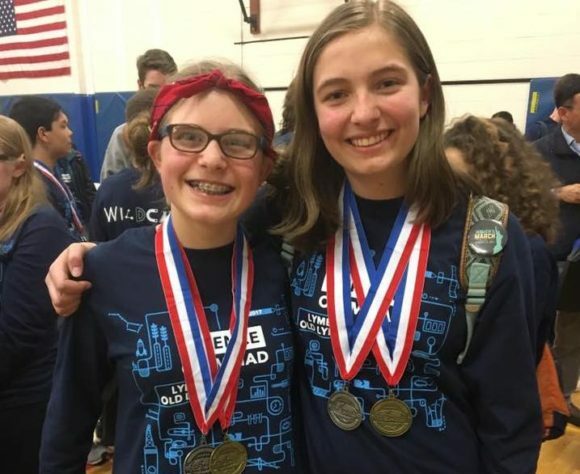 Proudly wearing their medals, team members Sadie Frankel (right) and Bella Hine share smiles after their team won the state Science Olympiad championship. By combining events from all disciplines, the Science Olympiad encourages a wide cross-section of students to become involved. Emphasis is placed on active, hands-on group participation. Through Science Olympiad, students, teachers, parents, principals and business leaders bond together and work toward a shared goal (https://www.soinc.org/). Congratulations to these budding scientists and good luck in Ohio! The cast of the show-within-the-show mourns the loss of their leading lady. All photos by Ellen Cole. Apparently the opening couple of nights of ‘Curtains’ have been a huge success, so ticket sales are expected for the two remaining performances are expected to be strong. Don’t miss the chance to see this great production — reserved seats are $15 for adults, $12 for students and seniors. Tickets may be purchased online at http://tinyurl.com/hjvw7yc or at the door. Songwriting team Georgia (Maria Donato) and Aaron (Dan Cole), along with show investor Oscar (Sean Spina) and producer Carmen (Callie Kotzan) read a review of their show. All photos by Ellen Cole. 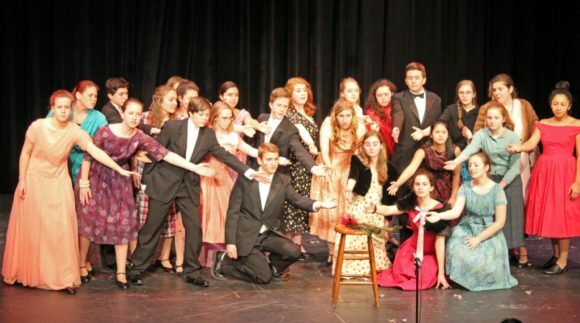 The Old Lyme Players’ production of Curtains, a musical comedy whodunit from the creators of Cabaret and Chicago. 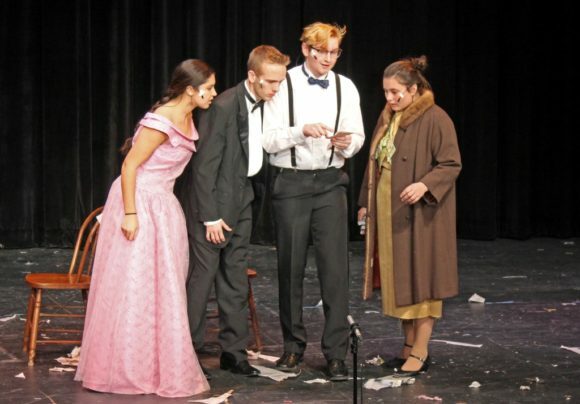 Curtains plays tonight and tomorrow at 7:30 p.m. and Sunday, March 5, at 2 p.m. at Lyme-Old Lyme High School (LOLHS) in Old Lyme. 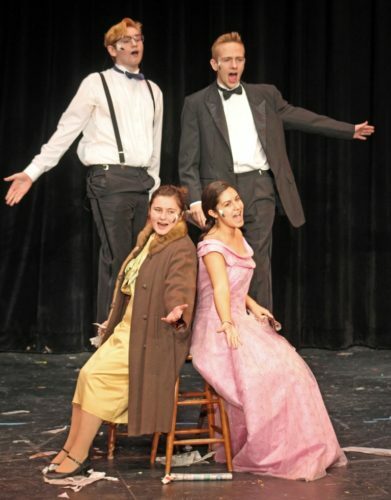 The cast of Curtains features 40 Lyme–Old Lyme High School students, with another 20 involved in the crew, pit orchestra, and production staff. It’s 1959, and opening night at Boston’s Colonial Theatre for Robbin’ Hood! — the flawed show-within-the-show at the center of Curtains. Robbin’ Hood’s untalented leading lady has been murdered, and the entire company is under suspicion as Boston police detective Frank Cioffi investigates the crime. Detective Frank Cioffi (Ben Jackson) flirts with ingénue Niki (Lauren Mitchell). Luc Bolduc, Phil Sweeney, and Liam Clark perform in the big number of the show-within-the-show. The composers and producers of the show-within-the-show (Sean Spina, Callie Kotzan, Maria Donato, Dan Cole) wonder ‘what kind of man’ could be a theater critic. Curtains opened on Broadway in 2007, starring David Hyde Pierce (Frasier, Spamalot) as Cioffi, for which he won the Tony Award for best actor in a musical. It ran for more than 500 performances. 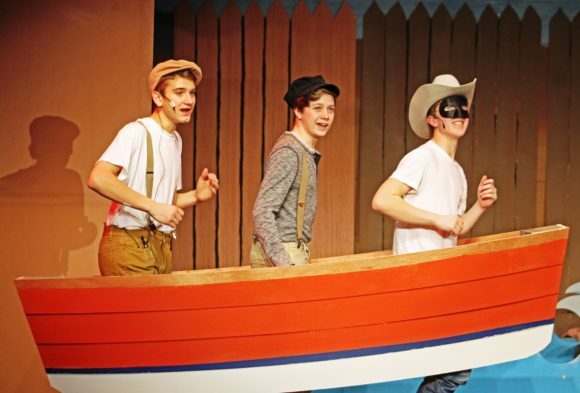 The Old Lyme Players’ production is directed by LOLHS teacher James Motes with choreography by Bethany Haslam (director of the Dance Center of Old Lyme), and orchestral direction by LOLHS band teacher Jacob Wilson. The cast features 38 LOLHS students, with another 20 students involved in the production’s stage crew and pit orchestra. Lyme–Old Lyme High School is located at 69 Lyme Street, Old Lyme. The school and auditorium are fully accessible, and there is ample parking. 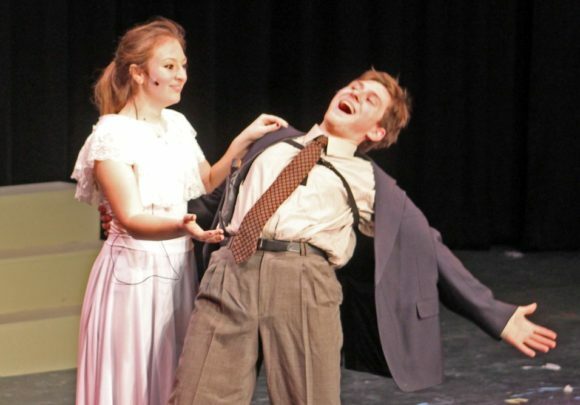 The Old Lyme Players present “Hello Dolly!” in the Lyme–Old Lyme High School auditorium this evening, Thursday, March 10, at 7:30 p.m., with subsequent performances Friday, March 11, at 7:30 p.m. and Saturday, March 12, at both 2 and 7:30 p.m.
Tickets are $15 for adults/$12 for seniors for reserved seating and can be purchased via this link. General admission tickets can also be purchased for $10 at the door by cash or check only. “Hello, Dolly! is a musical with lyrics and music by Jerry Herman and a book by Michael Stewart, based on Thornton Wilder’s 1938 farce “The Merchant of Yonkers,” which Wilder revised and re-titled “The Matchmaker” in 1955. It won 10 Tony Awards, including Best Musical — a record held for 35 years. See “Hello Dolly!” at Lyme-Old Lyme High School before Bette Midler reprises the role on Broadway in 2017! And if you still have any doubts about whether to go see this great production, check out this ‘commercial’ for the show made by students at the high school.